What’s It About? Young actress Julie Sawyer (Kirsty McNichol) adopts a stray white Alsatian that she hit with her car. Soon she discovers that the dog has been trained to attack any black person on sight. She’s referred by a canine expert to animal trainer Keys (Paul Winfield) who focuses on breaking the dog’s behaviour and eradicating its vicious instincts. Verdict: Director Samuel Fuller’s controversial film has been little seen around the world and was withdrawn from US theatres after pressure by the film studio. With that in mind, White Dog was never going to be an easy watch. But whilst most films deal with racism in the form of human interaction, it’s an entirely different beast watching it through the eyes of an animal. This wonderfully gorgeous, and rather large dog is a magnificent specimen of cuddly fun with his owner Julie. 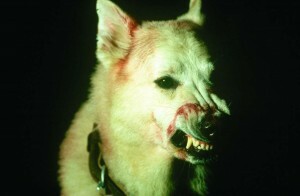 But when the nastiness comes out of him, it’s one of the most snarlingly scary and vicious animals seen on film. The slow-motion running of White Dog is beautifully filmed with majestic camera work but is also terrifies as he looms closer. Fuller’s objective is to lay bare all racism upfront and on screen regardless of how it makes the viewer feel. There are two intense moments in the film – when Julie comes face to face with the dog’s owner and the final 10 minutes of the movie – that are petrifying to witness, due to how the situation is dealt with by those so closely involved. Both break the heart for entirely different reasons. Kirsty McNichol’s soft portrayal warms the film through its tough times and Paul Winfield’s calm demeanour balances out the brutish dog during their scenes together. However, a film about a dog requires a strong performance from the central canine, and this is one of the greatest seen on screen. White Dog’s menace is so powerful that at times it feels it could come through the screen and attack you. To create such a powerhouse performance from the animal took special training, so we must mention the work Karl Miller did to train not one but five dogs. Extras: Wonderful new high definition 1080p uncut presentation that is as clean looking and sounding as possible, all overseen by movie producer Jon Davidson. Also included is a 48-page booklet with essays about the film, the words of director Samuel Fuller, his ‘interview’ with the dog and some beautiful and rare archival imagery. Final Words: The real-life ramifications of racism are exposed on the screen by director Samuel Fuller. It’s an immensely powerful film that bites the jugular and will linger long in the mind. White Dog is available on Blu Ray & DVD on 31 March 2014.